Then, we give equal time to cats. 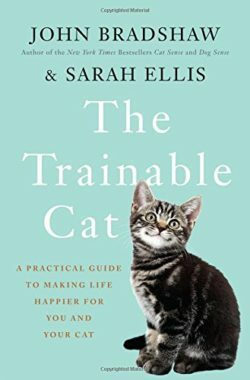 We re-air part of our interview with cat behaviorist Sarah Ellis about her book, co-authored with John Bradshaw, The Trainable Cat. It used to be that most stray dogs or dogs that were surrendered to shelters were put down. But no more. Since the spread of the no-kill shelter, more dogs are being re-homed. But also more dogs need homes than shelters can find. It’s even harder when you consider how stressed so many homeless dogs are. Fear creates negative behaviors, which make dogs more difficult to adopt — and the longer they stay in a shelter, the worse it can get. The animal shelter system is making big changes, from how shelters are designed to re-training and treating negative behaviors in dogs — and even to helping people keep their dogs instead of surrendering them. Journalist Amy Sutherland knows this system well. She’s been a shelter volunteer for years and has fostered and adopted many shelter dogs. One of them is Penny Jane (pictured top right), a dog initially so scared of people, Sutherland and her husband had to studiously ignore her — other than feeding her — for almost a year before Penny Jane felt safe enough to accept their attention. 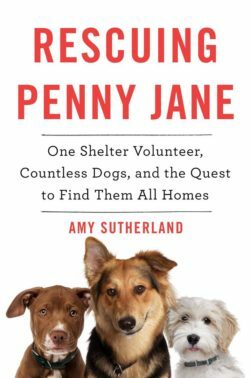 Sutherland’s book, Rescuing Penny Jane, melds the genres of memoir, history and how-to, to talk about the shelter system, her experiences with it, and how to adopt the best shelter dog for you. Sutherland is the author of several previous books, including Kicked Bitten and Scratched and What Shamu Taught Me About Life, Love and Marriage. Rescuing Penny Jane (Harper Collins) is her fourth book. Some people are dog lovers. Some love cats. Others love both. In the first segment, we talked about dogs. In our second segment, we hear a long excerpt from our 2016 interview with cat behaviorist Sarah Ellis, talking about the book she co-wrote with biologist and best-selling author John Bradshaw.